With CES 2018 coming very soon, numerous brands tease their latest products to offer including Samsung with the 34-inch CJ791 QLED Monitor with Thunderbolt 3 connectivity. The Samsung CJ791 pack features that enhance performance for both entertainment and professional productivity users. 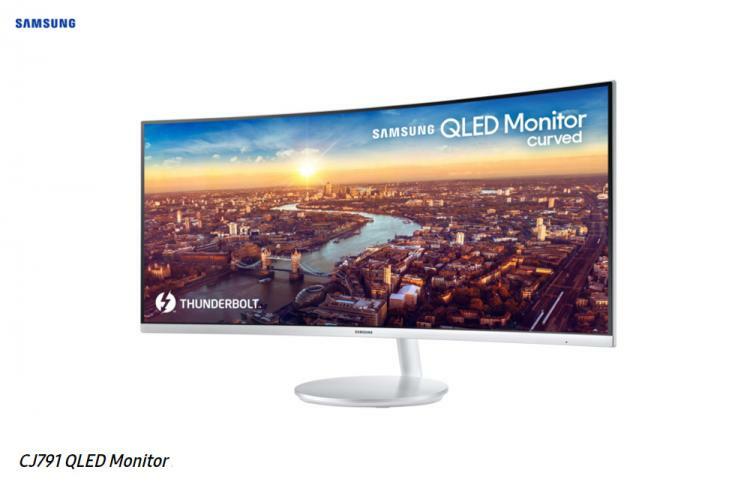 It is Samsung’s first curved monitor sport Intel’s Thunderbolt 3 connectivity offering processing speeds of up to 40 Gigabits per second which is nearly 400% faster than USB connectivity. The Samsung CJ791 offers excellent picture quality for both entertainment and professional content creation along with the convenience of high-speed connectivity of Thunderbolt 3. Using a single Thunderbolt 3 port, users can enjoy a wide selection of devices including Macs, USB type-C laptops, external storage devices and other desktop accessories without extensive wiring. The Thunderbolt 3 port also provides power for charging devices up to 85 watts. The Samsung CJ791’s 34-inch display uses a 21:9 aspect ratio with 3440×1440 ultra-wide QHD with 250% more pixel density compared to full HD alternatives. The display’s QLED presentation technology precisely reflects colours across a 125% sRGB spectrum offering excellent colour accuracy along with 1,500R curvature and ultra-wide 178-degree viewing angle. For gaming, the CJ791 has the “Game Mode” preset along with a speedy 4ms response time for smooth gameplay. Samsung with be joining CES 2018 at booth #15006, on Level 1 of the Central Hall in the Las Vegas Convention Centre from January 9-12, 2018.